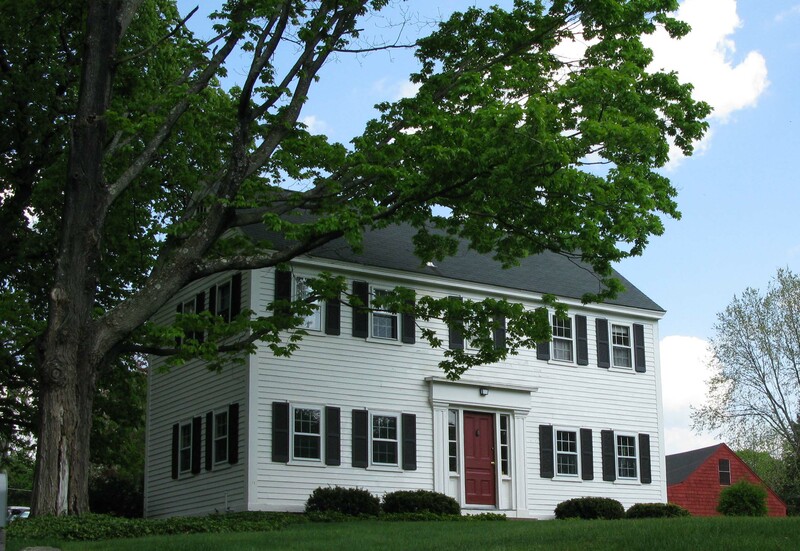 Typical five bay center entrance Colonial style home. Classic Federal entrance surround, side-lites., rear ell. 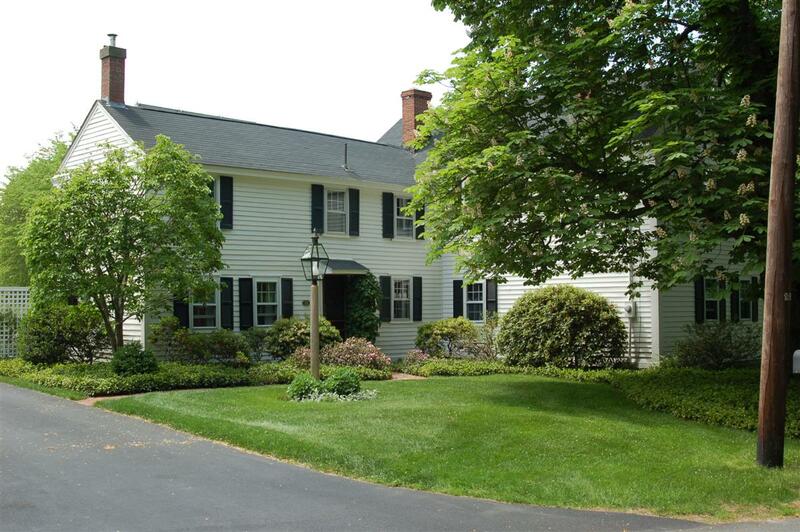 This property was once part of the twenty acre parcel with barn that was owned by Joel Russell who lived in the Russell homestead at 28 Rocky Hill Road. Joel became insolvent in 1839 and had loans out on several parcels of his farm. This lot was assigned to Joshua Ballard and contain the Russell barn which was located across the street from the homestead. Joshua Ballard sold the parcel to Frederic Mason on Aug. 31, 1839 for $1732. The 1850 Andover Valuation lists Frederic Mason, Dwelling house $900, Barn $300, 60 acre home farm $1500, 9 1.2 a Falls Wood lot $200, 20 acre Jenkins land $180 = 89 1/2 acres for a $3080 assessment. The Farm Stock valued $244. Frederic Mason was born on Nov. 28, 1803. Frederic married on Jan. 16, 1836 to Mary Cogswell b. Dec 14, 1807 dau. 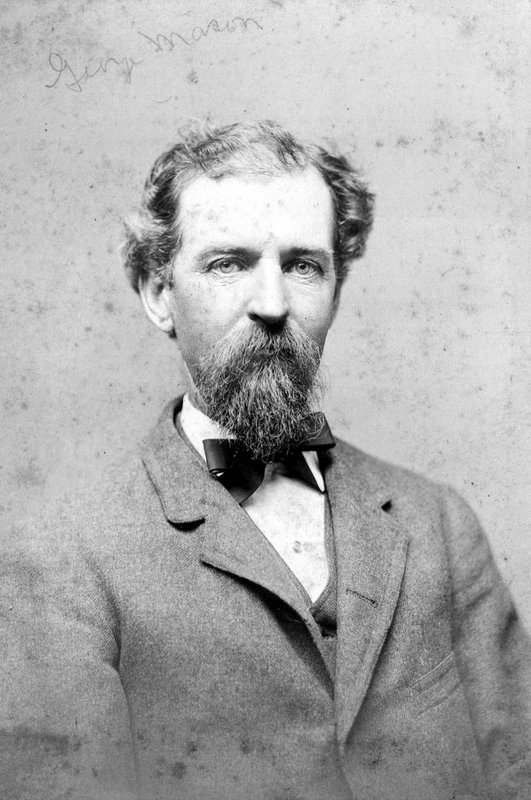 of Samuel & Mary (Eaton) Cogswell. They had two children; Sarah b. Aug. 11, 1838 and George F. b. Sept. 28, 1839. Frederic added parcels to his farm and had his mother Phebe living with him in 1855. Son George worked the farm with his father. George married in the Union Church at Ballardvale on Jan. 30, 1866 to Mary L. Farnham, a school teacher at the Holt District School (1863-1865) at the corner of Salem St. and Gray Road. Mary L. was b. Aug 30, 1842 in North Andover, dau. of Seth & Sarah (Tucker) Farnham. George & Mary had two daughters, Gertrude Cogswell b. July 5,1867 and Mary Fanrham b. July 7, 1869. Sadly wife Mary died on Oct. 30, 1869. The 1870 Census lists Frederic, wife Mary C. son George with his daughters Gertrude 3 and Mary 1. Also boarding in their home was widow Sarah A. Eaton with her six year old daughter Ella Eaton. Sarah A. was born on Aug. 18, 1839 daughter of Henry A. & Sarah (Bachelder) Gould. Sarah married at Free Church on Apr. 8, 1858 to Benjamin Ansil Eaton b. Sept. 9, 1835 in North Reading son of Nathaniel & Olive (Beard) Eaton. Ben was a Cordwainer,(shoe maker). Sarah gave birth to Ella Ancella Eaton on May 30, 1864. Ben had died at age 28 on May 4, 1864 prior to Ella's birth. His death in North Reading was listed from "Water on the lungs". George F. Mason married Sarah A. (Gould) Eaton on Nov. 17, 1870 at the Lawrence St. Church in Lawrence, MA. George and Sarah had two daughters Lizzie Gould b. Aug. 28, 1871 and Lucy Cogswell born June 3, 1877. George's father Frederic died on Nov. 8, 1871 and his mother Mary on Jan. 8, 1886. George F. Mason died of Epilepsy on May 5, 1892. He gave $300 dollars to each of his four daughters and Sarah the remainder of his estate. He is interred at South Parish Cemetery with family and Benjamin Eaton. Sarah remained three more years then selling the farm to Sarah M. Hutchinson on Sept. 4, 1895. Her daughter Ella married James E. Turner of North Reading. Sarah moved to 75 Park St. with daughters Mary F. and Lucy C. Gertrude married Charles W. Tucker on Mar. 9, 1898 and lived in Lynn, MA. Lizzie married Newton Jaquith Jr. on Au. 23, 1892 and Lucy C. married William Henry Gibson on June 20, 1906 who ran the Andover Laundry. Sarah Hutchinson held the farm for seven years then sold to Horace E. Dyer, wife Hattie P. on June 20, 1902. Dyer would own for 19 years.